Welcome to the March/April 2015 Edition of the HamSphere Newsletter. The HamSphere 4.0 network is in full operation with fully stable servers and we are now allowing "Trial Users" on the 4.0 system. You can use your trial account to test the new HamSphere 4.0 Transceiver. Just download the software from http://hs4.hamsphere.com/download and enjoy. If your trial account already expired, no worries...This Newsletter comes with an extension of your trial. Supports Straight Key (Handpump), IAMBIC A/B, 5-25 WPM, TX Delay, Side tone volume, USB RS-232 Interface, Mouse (Wired Disected Mouse), Keyboard (Shift or CTRL). Please Note! This plugin is still being tested and will be available ASAP. This is the first time we have been able to connect the HamSphere software to an external source. We are very excited about the new USB RS232 driver that will create numerous possibilities for us in the future. If you are interested in getting yourself a USB RS232 adapter, please contact Support for info on compatible devices. You can interface your Paddle or Hand-pump via the RS232 interface. By using a 9-Pin break-box you can easily connect the wires between your key and the interface. The "gray line" is a band around the Earth that separates daylight from darkness. Propagation along the gray line is very efficient. Ham radio operators and shortwave listeners can optimize long distance communications to various areas of the world by monitoring this band as it moves around the globe. This plugin also comes with UTC + Local Clock and your Sunset and Sunrise for your geographic position. Search users in the system and get Name, Country, ISO2, QTH, Lat, Long, Grid, Distance and Azimuth. You can also use it is as a grid lookup tool where you convert Maidenhead grid squares to coordinates. Both 4 and 6 grid resolution are supported. This is the "Micro" version of the Antenna Rotator that is needed for any rotatable antennas like Yagi or Beams. Type in the exact Azimuth with the keybord - Simple, effective and accurate. Phase driven curtain array, with big gain for the 48m band. Gain is +22.3 dBi. Please note that this antenna is meant for Transmission (TX) purpose as it pulls in quite a bit of noise on RX. This antenna will give you over 15 kilowatts ERP in the beam directions if you feed it with 100 watts. The antenna is available for 15m, 17m, 20m, 30m, 40m, 60m and 80m. * High radiation efficiency and low takeoff angle. * Optimized radiation pattern for extreme DX. * Allow copying and working station never heard before. * Uncanny ability to cut through hostile propagation. * Reduced in-channel selective fading by ensuring fewer hops. * Wont ever miss anyone calling from around 360 degrees while working weak signal DX. India DX Net (IDXN) is now in the twentieth month of regular operation and has grown from strength to strength as it has matured into the most active and stable net operation on HamSphere. The net is conducted every day, all seven days a week starting at 12:00 UTC and carries on for at least three hours if not more. India DX Net has logged over 2100 hours (spanning over 600 days) of fruitful discussions, interactions and question/answer sessions amongst participating HamSphere operators from all around the world. It is now the largest peer-to-peer interactive net with large numbers of checkins each day and has a much larger number of operators QRG who listen and follow the proceedings each day. On a regular day the net attracts 40%-60% of total users logged on to HS 3.0 system at that time and quite often the QRG is even higher. 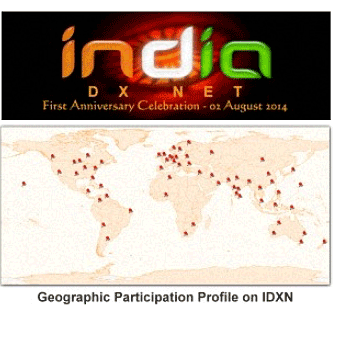 India DX Net has participation from all around the world. Those who are from USA and Canada join us with their first cup of coffee in the morning, while those in Australia and New Zealand make their participation in IDX Net as the last thing they do before going to bed. Other stations from various countries across continents of North America, Europe, Asia, Africa, Australia and sometimes-even South America and the Caribbean participate in IDXN. Over the years the net has welcomed operators from over 115 countries. India DX Net has always tried to position itself in a manner where operators who are new to the hobby are helped and motivated to learn and understand the finer nuances of amateur radio and develop the required skills to enjoy HamSphere. Ever since the lunch of HamSphere 4.0 in August 2014, IDX Net has assisted numerous users to painlessly migrate to the HS4 platform. Our endeavor has always been to provide authentic and definitive answers to queries in all matters pertaining to both HamSphere 3.0 and 4.0. All stations from around the world are cordially invited to join the India DX Net. Please do not get dissuaded by the name. It is not a regional net but a worldwide net. At the moment you can join the net on HamSphere 3.0. However, subsequently IDX will migrate to HamSphere 4.0. This is our long standing desire, but we have stayed back so far on HS3 to fulfill our moral obligation in assisting new operators who join HamSphere to acquire minimum necessary skills needed to venture into HS4. IDXN will soon create history by being the one and only global net with a worldwide reach to run in the HF Radio environment. Come and join us and be a part of history in making. 160m Top Band Award 20 unique QSO's where: 3 stations 5000km+ 7 stations 3000km+ and 10 stations any distance all on 160m band. USA 80m Award 25 verified US States on the 80m band. 40m World Award 60 unique QSO's where: 10 stations should be 10000km+ 20 stations 5000km+ and 30 stations any distance all on the 40m band. Activity Award 250 250 verified QSO's. Activity Award 500 500 verified QSO's. Activity Award 1000 1000 verified QSO's. Worked 50 Countries Award 50 verified countries on all bands. Worked 100 Countries Award 100 verified countries on all bands. Worked 150 Countries Award 150 verified countries on all bands. Asia 30m Award 15 verified Asian countries on 30m. Worked Asia Award 35 verified Asian countries on all bands. East and South East Asia Award 15 verified East and South East Asian countries on all bands. Australian / New Zealand Grid Award 15 verified grids in AU/NZ. European Grid Award 150 verified Grids in Europe. South American Grid Award 20 verified grids in South America. 60m Award 60 QSOs, 40 Grids, 25 QSOs over 3000km. 20m World Award 200 QSOs, 100 Grids at 3000km+, 25 grids over 10000km. Multi Award Worked 80 grids squares on each band 17-15-12-11-10m at 5000km+ with at least 20 grid squares on each band at 10000km+ Only one QSO with the same station is valid per day (24h). 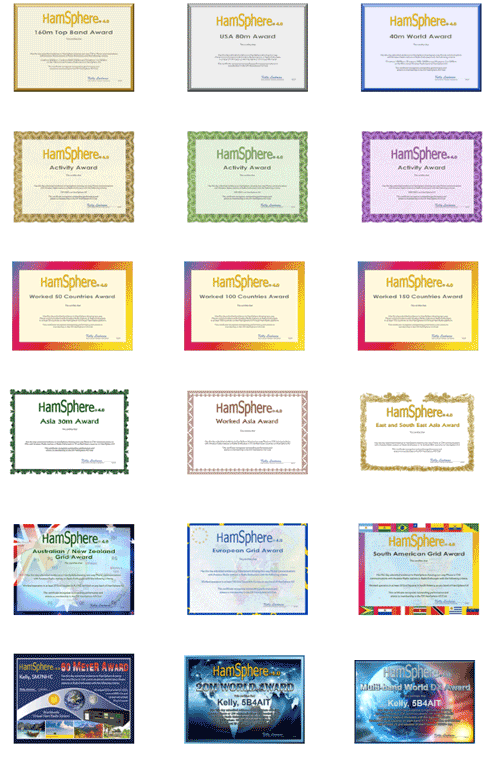 Check out the HamSphere 4.0 Awards here! We have a new calculation algorithm in HamSphere 4.0 DXHC where operators get "points" for different awards and achievements. All awards and their "value" in points are valued based on "skill" level. The harder an award is to achieve, the higher the points. Our 80 Meter HamSphere 4 Early Bird Net has over 100 operators logged in from 34 US States and 7 Canadian Provinces. Most days we have between 12 to 16 operators checked in. The hours have changed with Daylight Savings time to 0900 - 1100 UTC, making for some REALLY REALLY EARLY BIRDS. It's open to all HS4 subscribers as is the corresponding Facebook page. Ops are encouraged to share pics of their rigs and other Ham related memorabilia. It's a Round table style net with myself as the usual Net Controller. The Net was formed to promote HS4 and to take advantage of the wide-open propagation on 80 meters for USA and Canada that time of day. The HamSphere North-America 60 Meter Net began in November, 2014 when Dean, 9HS158, Steve, KC3AZT, Harold, KC9HH and Rich, 2HS2020 including myself, Terry 9HS299 were rag-chewing on 5.330 MHz. on the 60 Meter Band. Our signal strength of 5/9 to each other was fantastic and we noticed that we were all within a range of 600 miles from each other. We then decided that it might be a good idea to look at running a Net on the 60 Meter band for all of North America. When we contacted Kelly Lindman, he encouraged us to move ahead with the idea of a 60 Meter Band Net. It would be ideal for local QSOing. Kelly set up a Facebook page for the Net and by November 3rd everything was in place. We started our first net to run from 9:00 p.m. EST but quickly learned that since most of our operators wanted to watch a little TV before they went to bed circa 10 p.m., we decided to start our Net sessions at 8:00 p.m. We felt that Monday to Thursday from 8:00 p.m. - 10:00 p.m. was perfect and we set up each Net Controller to host one night of the four. In a very short time, over 60 operators visited us throughout the week. Most of them were within a radius of 600 – 800 miles of each other. As the Net became more popular, we could hear distant operators from as far away as Alaska, wanting to join the rag chew! We currently have 110 operators including about 42 members on our Facebook Group page. Recently we have decided to change the Net operations starting at 00:00 UTC local time to 01:30 UTC and include every other Friday evening. Jon (2HS9327) has also joined the Net Controller Team and again we welcome his enthusiasm and leadership type skills. Our subject matter for each Net covers a variety of subjects from how to, including any questions, which may be about the HamSphere program. Steve is always willing and very experienced with computers and especially the workings of 3.0 including 4.0. He is more than willing to do his best in order to resolve any problems, which a participant may be encountering. Obviously this is a very successful Net and I want to thank and extend my sincere appreciation to Kelly and the Net Controllers who have generously donated their knowledge, time, and humor each and every week in an effort to bring a true spirit of Ham Radio operation onto The HamSphere 60 Meter Band. To make it a little easier to work Split-Frequency operations I added a second VFO Frequency display to my transceiver and selected [R]eceive on one frequency display and [T]ransmit on the second one. 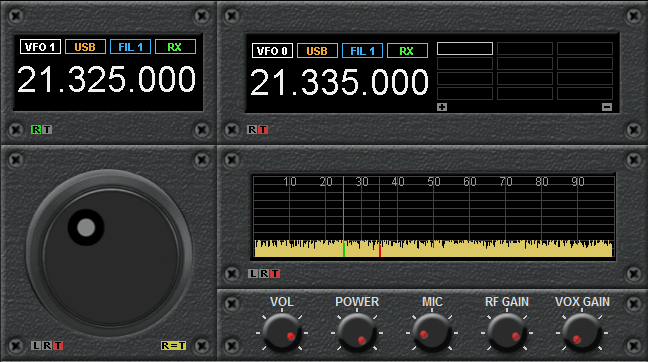 This makes it nice and easy to see exactly what frequencies you have selected for Rx and Tx. Of course this can also be done on the standard transceiver with one single frequency display (you just have to switch between the RX and TX modes on the single frequency display). If you look at the Band Scope (or waterfall display) you will see the Transmit and Receive frequencies are marked with separate vertical lines, One is Green (the RX frequency) and one is Red (the Transmit frequency). You can select the small [R] button near the bottom left of either the band scope or waterfall and then click on the band scope (or waterfall) to set the frequency you want to receive on. Then you click on the small [T] button on the band scope (or waterfall) and click on the frequency you want to transmit on. I hope this helps more operators to get into working Split Frequency operation, as it can be a very effective way of operating in a pile up situation. The most important thing is that you must listen to the DX Station so you know what frequency he is listening on. The frequency the DX station is listening on will be your TX frequency and of course your RX frequency will be the one you can hear the DX station on. - NOTE #1: When a station is working SPLIT, He can not hear anyone calling him on the frequency he is Transmitting on, so calling on the same frequency you hear the DX station on will only cause QRM and stop anyone from being able to hear the DX station which ruins it for everyone. - NOTE #2: When returning to any CQ or QRZ call from any station It helps greatly if you only say your call sign once when calling and nothing more -- Long drawn out calls just cause unwanted QRM and make it much harder for the DX station to pick out call signs - operators who give their call sign more than once and those who give call sign, name, location, etc. are just being inconsiderate to everyone else and making it harder for everyone including the DX station to make contact - I Hope this helps more operators understand what Split-Frequency Working is and How to use your HamSphere 4 transceiver to operate with Split-Frequencies. The HamSphere 4.0 DX-Cluster works like a traditional cluster with contributing "spotters". But HamSphere has taken this to a new level. Each time an operator shares a DX-Spot it is automatically rewarded HamSphere credits which can be used to purchase Antennas, Plug-ins and Subscriptions.Operators may also gain credits by winning contests and other activities. We must admit that a lot of HS4-'users' come online a couple of times and then decide to go back to HS3 again. 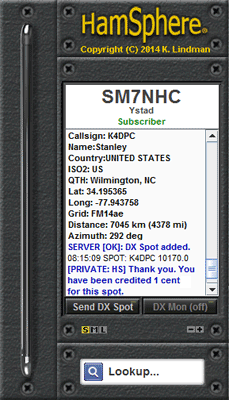 The rare DX-station makes only a short appearance on HS4. And I think the reason is that HamSphere 4.0 is not that easy to operate (when you are used to HS3). So, when a "rare" DX-station makes his first steps on HS4 they will be smashed down by a swarm of hungry bees looking for nectar. Imagine that you just learned to play in the "child-pool" and at a certain moment you decide... well, let's go to the big swimming pool... just to try how far I can swim? When you arrive there, hundreds of other swimmers are waiting to swim in line with you. You don't have a chance to breathe, don't have a chance to look around and find out how deeper water feels. I'm sure a lot of us will jump out the water and get dressed again. No? What can we do for new HS4-users then? - Ask them to become a Facebook friend and help them out via chat there. - Be patient with new stations. - If you know that a "rare DX-station" decides to try HS4 instead of HS3, be careful mentioning this to others as you will otherwise create a "huge bunch of guys" waiting for him/her. Certainly, when you know that the new HS4-user has no experience with propagation, filters, lower signals, etc. etc. I know, it isn't easy... but it's all up to us to make the HS4-family bigger. HamSphere will not endorse, support or sponsor any other special activation call signs other than DXpeditions so please do not ask for special call signs for special events. IMPORTANT! Make sure you plan your DXpeditions and have all "Special" call signs prepared and in working order BEFORE you head out. Please contact Martin 161HS363 to provide you with Special Activation call signs. Our authorized "Expedition" call signs will be very specific. We are starting out with the IOTA (Trademark of RSGB) Island On The Air concept. We will have this IOHS = Islands on HamSphere. Later on we may extend these DXpeditions to cover Lighthouses, Castles or other exciting fixed landmarks. 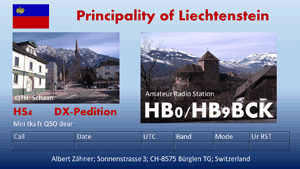 HB0/HB9BCK Albert was active on HS4 on the weekend (7,8 March) until Monday. 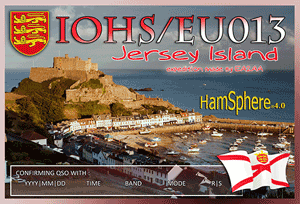 A big event for HamSphere DX hunters was carried out 6/7 March 2015. 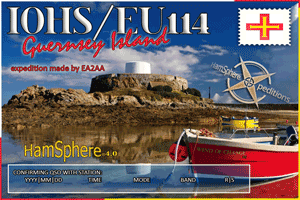 Jose EA2AA was active on Guernsey and Jersey, British Channel Islands. The event was held at both HS4 and HS3. Start time: Sunday at 18:00 UTC and final time Tuesday at 12:00 UTC time. Start time: 06.03.2015 Friday at 18:00 UTC and final time Sunday at 14:00 UTC time. 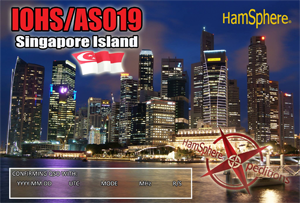 IOHS/AS019 SINGAPORE ISLAND was active on HamSphere 4 by Robert 60HS164 who was in Singapore from 6th Feb to 12th Feb - Robert was active on HS4 for 2 hours per day. 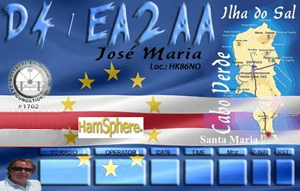 Jose Maria EA2AA was active with D4 / EA2AA from Santa Maria Ilha do Sal - Cabo Verde 3-16 January 2015. Call sign D4 / EA2AA. He worked on both versions. 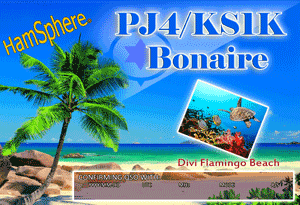 PJ4/KS1K, Dave was active on HamSphere 3.0 and 4.0 for a few days from 9 January 2015. One of the best DX - expeditions in 2015. 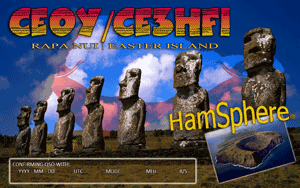 CE3HFI George worked from a hospital in Hanga Roa, Easter Island like an engineer. George worked on HS 3 and 4 : 01/18/2015 - 31/01/2015. The only problem was the internet connection which is satelite and worked very slowly. 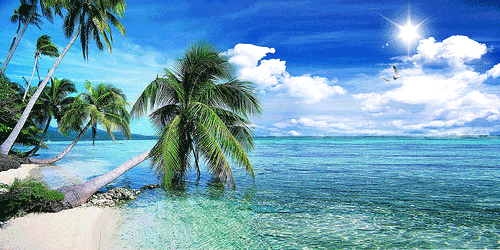 If you interested in a special call sign or to make a DXpedition. Martin 161HS363 is our DX Coordinator for DXpeditions, IOHS, special callsigns and other activations. Here are the results, from the HamSphere "Christmas Contest 2014" that was held 2014-12-26 08:30 to 11:00. The results are based on a properly filled out logbook and that power limitation were kept. Congratulations to LY3BHY who won this contest with the score of 1539. Here are the results, from the "HamSphere 4 New Year Contest 2015" that was held 2015-01-01 during 24 hours. 1st Prize: Pat, 14HS1, France with 96462 points wins 100 HS Credits. Congratulations! 2nd Prize: Andy, SP2DNI, Poland with 68880 points wins 50 HS Credits. Congratulations! 3rd Prize: Garry, 310HS104, Latvia with 52710 points wins 40 HS Credits. Congratulations! 4th Prize: Mike, WB7ECW, USA with 48590 points wins 30 HS Credits. Congratulations! 5th Prize: Albert, HB9BCK, Switzerland with 46350 points wins 20 HS Credits. Congratulations! 6th Prize: Andrew, UT1ZZ, Ukraine with 43240 points wins 10 HS Credits. Congratulations! 7th Prize: Evlogy, 178HS411, Bulgaria with 36603 points wins 10 HS Credits. Congratulations! 8th Prize: Pavel, UR5FAI, Ukraine with 35076 points wins 10 HS Credits. Congratulations! 9th Prize: Roman, 50HS2096, Russian Federation with 35076 points wins 10 HS Credits. Congratulations! 10th Prize: Marco, 13HS2402, Germany with 32300 points wins 10 HS Credits. Congratulations! 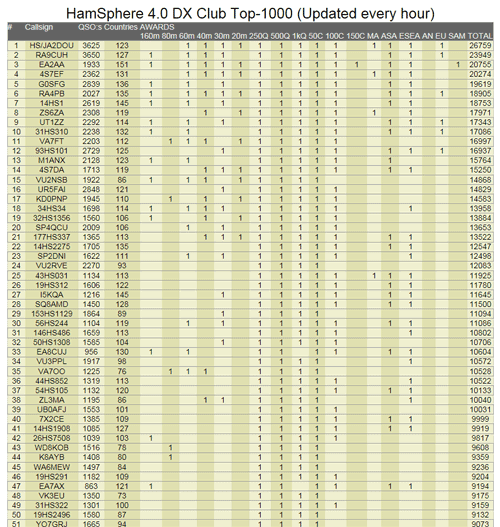 Here are the results, of the HamSphere "HamSphere International DX Contest 2015" that was held 2015-02-21. The results are based on a properly filled out logbook and that power limitation were kept. We had a total of 155 participants performing 4979 QSO's. Congratulations to Gaudentas LY3BHY who made the 1st place with the score of 46320 points. He receives a prize of a 1 year subscription (30.00 HS Credits). Gaudentas managed to complete 240 valid QSO's and 192 multipliers. Congratulations! Each complete confirmed non-duplicate Phone contact with a ESEA station is worth 3 points per band. Congratulations to Toshi Y, HS/JA2DOU who won HS4.0 Asian Contest A with 5909 points! Each complete confirmed non-duplicate Phone contact with an ESEA station is worth 3 points per band. Congratulations to Ravi Kumar, VU2RVE who won the HS 4.0 Asian Contest B with 1953 points! Congratulations to Toshi Y, HS/JA2DOU who won HS4.0 Asian Contest A with 13500 points! Where Has It Been and Where Is It Going? Since its initial concept going back some three almost four years ago on the HamSphere 2.0 and then the 3.0 platform the BC Band has been somewhat a hidden treasure or a hobby within a hobby. Subscribers and DX Users would come near and far just to catch a glimpse of a live simulated broadcast from a number of Operators being Hams and Non-Hams. One of those broadcasters being myself, (2HS1434) at the time would hit the BC airways just about every other week on a Friday or Saturday night having a full nonstop two or even three hour broadcast revolved around a featured music artist. With a pre created file formatted program which also contained segments of going live I found myself swept away into a totally different world which would let me show to the listeners, and most of all myself unknown talents which came with time and hard work. I found it to be very rewarding and at the same time a continuous challenge to find that perfect broadcast audio sweet spot. It’s a challenge to tame the BC Band being the old or the new, they remind me of the two tough friends we all once had as a child. A few months after the new HamSphere 4.0 platform hit the public market the BC Band once again came alive with unidentified and identified type broadcasting throughout the Northern and European Continents. I was most fortunate being a Beta Tester to have the one time unique opportunity to kick the tires and once again light the fires and just see for myself what I’m up against. I basically had the entire band to myself when at the time there was no other BC, (Broadcast) going on. Using the factory IDC antenna my first BC, if memory serves me right, was the song Imagine by John Lennon. With wattage set to max I was then able to monitor my TX from England from what is now a DX Monitor. Words can’t describe the tingle throughout my fingers when I started the transmission listening through my laptop per the monitor. It sort of reminded me of how Reginald Fessenden must have felt in many ways back in 1906 with nothing but a noise floor of S2 QRN and the ionosphere giving into the faint but struggling transmission of a far distant first time ever transmission. At this time HamSphere 4.0, still in its newborn stage, has attracted many new people who are already Hams and non-licensed professional operators as well. The concept of even having the 48 meter BC Band has been discussed with positive and negative point of views as well. However it seems as though that we are finding it to become a more valuable tool then we first realized, being that it has the potential to become a possible fore ground for the golden rule of true Ham Radio, “ Spreading the Good Will and Spirit of Ham Radio ”. Very limited wording but if exercised properly will be simply accepted within the Ham Radio community, as well as HamSphere itself. Recently we have created a 48 meter BC Band Team to somewhat step in and add structure to this quickly reborn art if I may. The latest new broadcasters have been spreading out within the band and seem to be exercising the common gentleman’s agreement as to try to not interfere with other broadcast. We feel that as time passes more and more operators will be coming on board to acquire this unique opportunity. In due time a new format will be announced as to new set forth rules and regulations including possibly adding a remote monitoring system in order to help broadcasters see and hear for themselves how they are sounding over the simulated air ways. New plugins, which will enable one to create a new one off BC Band License, is also in the works. The operator will be given the choice to receive an automated type official license or create his/her custom call sign. We are excited and highly looking forward to probably the best of times for the BC Band to come! Here are a few comments from our current broadcasters. 73 and good broadcasting from the HamSphere Staff including the new BC Band Support Team! Bob Burkey, WB3BAB (WITER Privateer Radio) writes,” I sure enjoy the BC band. I like listening and like broadcasting also. My station beams East and West from the Pittsburgh Penn., USA area. 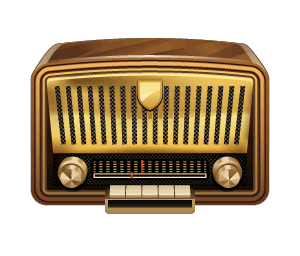 Broadcast a variety of music along with talk from old time radio, mostly thriller radio programming. I broadcast on 6.275 MHz. Try to broadcast every evening around 7 PM EST 00:00 UTC. I would like to thank Steve, Kelly and the gang for helping me out. Sort of living a dream of broadcasting. 73 to all my friends here take care and have fun with the BC band. We have now received over 23,500 recommendations on Facebook – Thank you FB users. And Thank You to over 4500 followers on Twitter. Super! !